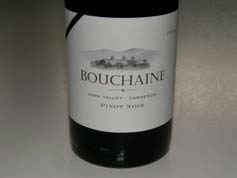 Bouchaine Vineyards is the oldest continuously operated winery in Carneros. The winery’s barn-like building is surrounded by beautiful gardens and barrel hoop sculptures. The estate vineyards are among the southernmost plantings in the Napa Valley and the highest landmark terraces in the Carneros district. Long time winemaker Mike Richmond, the former founder of Acacia, has a reputation for crafting elegant and sophisticated Pinot Noirs. The winery’s Pinot Noirs are sensibly priced. 14.5% alc., 2,500 cases, $30. · Closed initially, then opening nicely in the glass with swirling. A rich and sturdy wine with a tasty core of dark red cherries and berries with currants, tobacco and smoky oak that linger on a persistent and noticeably tannic finish. This wine will pair well now with hardy meats. Still fine the next day from an opened and re-corked bottle indicating this wine will age for 5 to 7 more years without difficulty. 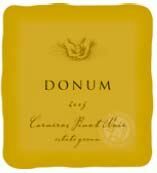 The Donum Estate (Donum translates from the Latin to “gift” and refers to grapes as a gift of the land) is devoted solely to a Carneros estate Pinot Noir and a Russian River estate Pinot Noir. Winegrower and President, Anne Moller-Racke, was the Vineyard Manager for Buena Vista Carneros for many years and played an instrumental role in obtaining appellation status for Carneros and the formation of the Carneros Quality Alliance. With the sale of Buena Vista to Allied Domecq in 2001, the Racke family of Germany split off 250 acres of the Buena Vista Estate to form The Donum Estate as well as to grow grapes for the rejuvenated Robert Stemmler label. The true origins of the Pinot Noir selection in the Donum Estate Vineyard are unknown and the selection has become known as the Donum “clone.” The Donum Vineyard also contains several other clonal selections including Calera, Hanzell, Swan and Dijon 777. The winemaker for The Donum Estate and Robert Stemmler is talented, young Kenneth Juhasz, who also crafts wine under his own label, Auteur. The first release of The Donum Estate Carneros Pinot Noir was 2001. 14.5% alc., 575 cases, $60. Cool weather at bloom caused a light set and yields were only 1.88 tons per acre. 100% de-stemmed, cold soaked for 4 days, aged on the lees in 75% new French oak for 11 months. · Expressive nose starring black cherries and hinting of Provencal herbs and smoke. A full flavored black fruited wine with a soft texture and gentle finish. Smoky oak accents carry thru and persist on the aftertaste. 14.4% alc., 850 cases, $65. Unusually long growing season. The vineyard averages 115 days from bloom to harvest but in 2005 it was 130 days. 100% de-stemmed. Cold soaked 5 days. Aged on the lees 11 months in 75% new French oak. · Deeply colored. Vibrant and deep aromas of black raspberries, blackberries, toast and herbs. Darkly fruited and fullbodied in style with soft tannins and a strikingly velvety texture. The flavors are complimented by an earthiness and subtle oak char. Clearly one of the top wines from the Carneros region in this vintage. Schug Carneros Estate Winery was founded in 1980 by Walter Schug who was the founding winemaker at Joseph Phelps Vineyards in the 1970s. In 1995, Sonoma born winemaker Michael Cox joined the winery and he has carried on the Schug tradition while instituting modern winemaking techniques. 13.5% alc., $28. · A simple but satisfying Pinot Noir featuring cherry and berry fruit, a sprinkling of herbs, a hint of smoke and a touch of citrus. Moderately light in body with silky tannins and a clean finish. A perfectly fine daily drinker. Saintsbury cofounders David Graves and Richard Ward celebrated their winery’s 25th anniversary in 2006. Together they launched Saintsbury in 1981 after meeting at University California Davis and discovering they had a shared passion for Pinot Noir. They decided to stake their claim in Carneros and sourced all of their grapes from that appellation. They released 2000 cases of Pinot Noir from purchased grapes in 1981 and never looked back. By 1991, production had increased to 35,000 cases and their Pinot Noir was on practically every restaurant list in the United States. Graves and Ward like to kid about their success, thankful because, “Our attitudes and work habits make us otherwise unemployable.” The hallmark of Saintsbury wines has been a high quality to value ratio and consistency from vintage to vintage. Saintsbury has about 13 acres of vineyard around their unpretentious and weathered barn-like winery and the estate-owned Brown Ranch Vineyard nearby, but they source most of their grapes from Napa Carneros growers through long-standing relationships. Winemaker Byron Kosuge left Saintsbury in 2004 to pursue his own label and was replaced by Jerome Chery who apprenticed with Littorai’s Ted Lemon from 2000 to 2004. In 2004, Saintsbury abandoned their Reserve bottling and launched a series of vineyard-designated Pinot Noirs from Napa Carneros. Saintsbury also produces a Carneros appellation bottling that is widely available, Garnet which is a lighter-styled early drinking Pinot Noir and a Vin Gris of Pinot Noir (Vincent Vin Gris). The Saintsbury Brown Ranch Carneros Pinot Noir is the winery’s flagship, the only vineyard-designated Pinot Noir produced from estate fruit and consistently an outstanding collectable wine. 14.5% alc., $60. · Enticing aromas of strawberries, Bing cherries, brown sugar and baking spices. An elegant and softly textured Pinot Noir featuring a red fruit profile, a touch of earthiness and a deft touch of oak in the background. A seamless wine with a lingering fruit-kissed finish. Not as stellar as the 2005 vintage, but a fine wine in its own right. Saintsbury Winery is named after George Saintsbury, who in the early 19th century wrote Notes on a Cellar-Book. Historian Thomas Pinney has updated Saintsbury's work in a new edition published by UC Press, Berkeley ($29.95). Much of Saintsbury's writing was confounding and obscure to say the least, but Pinney has brought many of Saintsbury's references and his obtuse commentary to light. The book is a great read for lovers of historical writings on wine.